I’m staying in the GNOME village with Scott, my long haired fire-juggling friend from near home. We’ll be there from 23rd-30th June. EDIT: I have been asked to provide evidence of this absurd claim. Here we go then. 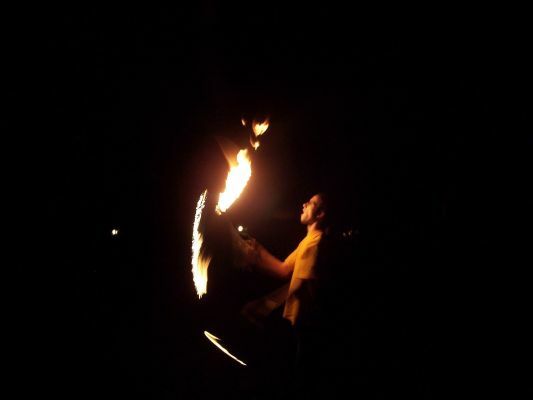 If you see anyone wondering around Vilanova with flaming batons, you’ll know who it is. Following on from the last 2 years, we’re hosting another Gentoo UK users-and-developers conference this year. For the last 2 years, we have held the event in the north of England. This year, we decided to try in the south, in a more accessible location: Central London. The event will take place on Saturday July 8th. The event will be composed of a series of sessions and presentations by Gentoo developers, and one or two by external speakers. Anyone interested in Gentoo is welcome to attend, just let us know you are coming by pre-registering (no cost). There will be plenty of time for socialising with other users and developers before and after the conference. More information is available from the event website. It’s very encouraging to see interest from developers from other parts of Europe at such short notice. Danny van Dyk, Bryan ÃƒËœstergaard, and Tobias Scherbaum will be flying over for the event, and hopefully a few others will follow (contact me if you are interested). I have made a list of attending developers which is growing all the time. Users experienced with Gentoo’s console install method may be familiar with net-setup, a simple ncurses/dialog utility to configure network interfaces. It can also be used on a live system (found in the app-misc/livecd-tools package). One source of confusion during installation is the naming of network interfaces – this is sometimes different from the naming on a live system (eth0 swaps with eth1, etc). This will be available in the next livecd-tools release. Thanks to Google, a number of Gentoo-oriented Summer of Code projects are being sponsored. Hopefully Gentoo’s Gentoo Summer of Code project page will be updated soon to reflect the projects in development. We have added some of the participating students to Planet Gentoo and Gentoo Universe, the remaining participants will be added over the next few days. We have also set up Planet Gentoo Summer of Code which provides a feed exclusively from the SoC students. I look forward to watching the projects unfold.